Sometimes, the journey begins when you feel like giving up. How do you yoga? Have you ever used your yoga practice to deepen self-awareness and welcome inquiry and sometimes discomfort, ultimately to RISE up out of the ashes? We will explore this concept and so much more at this year's one day mini-retreat on August 26 at Hawaii Island Retreat. Rise to the challenge! Breathe in fire and exhale peace, equanimity and balance. 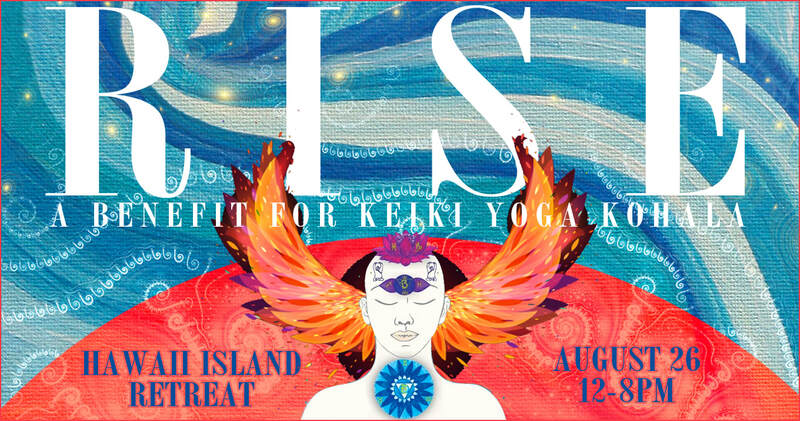 All proceeds benefit Keiki Yoga Kohala, the program that brings yoga into the classroom at Kohala Elementary School, now in its 12th year. Similar to previous benefit events, we will be offering several class times with two concurrent class options. Check back for a solid schedule to be posted soon, as well as links to ticketing! Doors at 12. We will kick off the day's programming at 1pm with a Heart Song Circle, facilitated by Mahina Lee. Classes begin at 2pm. Crystal bowl alchemy through Clarity will be provided throughout the day. 6:30 pm Vegan local organic dinner and music by Debasish Bera and Noelani Love. 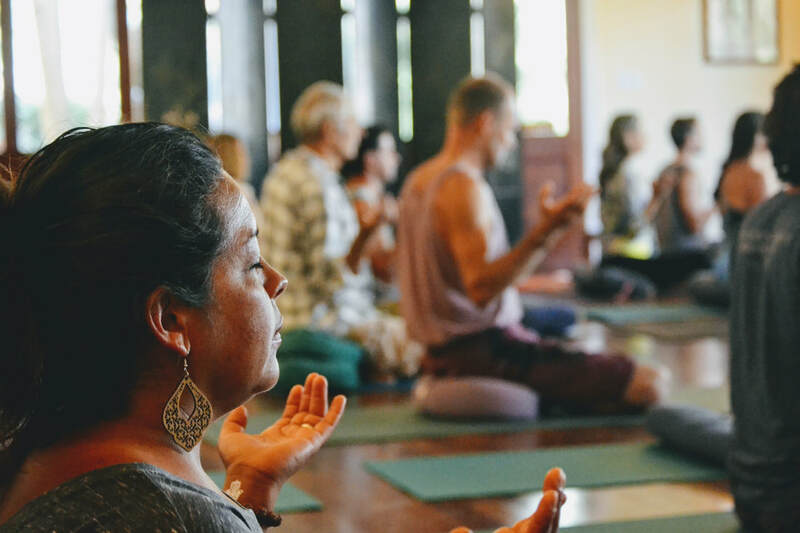 ​Keiki Yoga Kohala is an empowering yoga education and healthy lifestyles program now celebrating its 12th year. 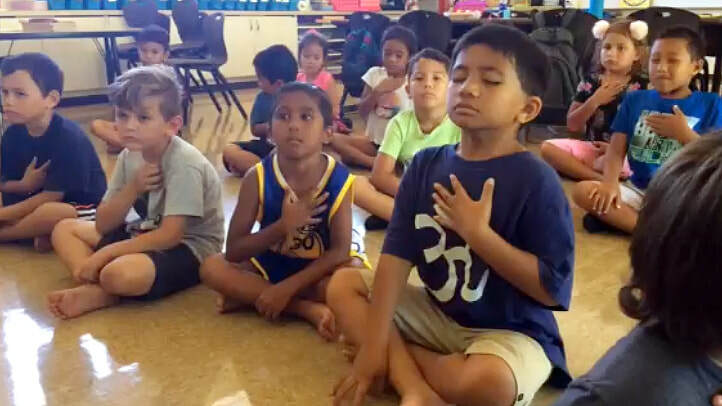 The program serves all 345 students and their teachers at Kohala Elementary School by delivering 30 minute yoga sessions directly in the classroom. Our goal is to help provide students with opportunities to learn self-care techniques, as well as exploring the mind-body connection through yoga poses, breath work, mindfulness exercises and games. In a world where more emphasis is put on testing and less time is given to children for physical activity, these classes are sometimes the only opportunity for a student to exercise and de-stress during the day! 2018 benefit all day pass. Choose up to three classes from five offerings. Includes dinner + music. IMPORTANT: Make a "note to seller" of class selections during checkout to ensure your place in class. Also, please notify us if bringing keiki. Come for an intimate evening of vegan local organic dinner plus musical performances by Debasish Bera and Noelani Love. Short on time or on a budget but still want to participate in an epic event? Drop-in to any class of your choosing, a la carte style. No limit to the number of classes you sign up for. Does not include dinner + music. To add, please purchase the "Om pass" separately. IMPORTANT: specify which class(es) you would like to RSVP for at checkout as a "note to seller." 2018 benefit all day pass, available to teachers only. Choose up to three classes from six offerings. Includes dinner + music. IMPORTANT: please make a "note to seller" of class selections during checkout. SPACE IS LIMITED! Please register early. The 2018 Benefit will be held at the beautiful and tranquil Hawaii Island Retreat Hotel and Spa located on the stunning oceanside cliffs of Kapa’au in North Kohala. For directions, please click here. Park in front of the energy building (look for roof top solar panels) near the public access path. If you would like to show your support but aren't able to attend the benefit please consider donating directly to the program. Your donation is 100% tax deductible. MAHALO! Please make your class selections during checkout. Meet and mingle with our yoga community, enjoy some refreshments, walk the grounds, locate the bathrooms or purchase a lucky number ticket. Enjoy the healing vibrations of the crystal bowls. A.C. will be sounding her crystal bowls throughout the day. She will be accompanying Narayan's Classical Kundalini class and Noelani's Shakti Kundalini Flow class during sivasana. You are invited to take a journey into improvisational movement and sound as we gather to co-create harmonic sounds from our hearts. Join a song circle in the tradition of Rhiannon and Bobby McFerrin. Listen for your inner voice while also blending with the sounds of others and as we practice unconditional acceptance for ourselves and one another, we create a collective prayer of heart song. All are welcome to co-create in this safe space. Led by a team of volunteers. If you plan to bring keiki, please let us know when you complete online registration in the checkout process as a "note to seller" so that we may better serve you. Planned activities include mandala making, yoga poses and games, walking meditation, guided imagery, dream board making, toning and much more. ​Classical Kundalini as taught by Yogi Bhajan to activate and ground Kundalini, so that you may experience life with more joy. Crystal Bowl Alchemy through Clarity during sivasana included. Through Restorative poses you come into harmony with your body's natural rhythm to rest, heal and recover. After specific Restorative work to open up the body-mind for deeper work, Pranayama instruction with clear direction will follow. A somatic education using gentle movement and directed attention to help people learn new and more effective ways of moving. ​A sacred shakti Kundalini flow balancing the masculine and feminine energies within. ​Chelsea will lead you into a deeply relaxing and integrative experience that slows brainwaves and quiets the mind. Delicious locally sourced, organic and vegan. Creative menu in the works and TBD. Performing two Sanskrit chants, two Hindi Indian songs, an original Bengali song and an English original. Quiet the mind by singing the spirit. Join Maureen in singing devotional yogic chants and sharing in the prayer for peace to all. Singing mantras assists in cultivating, supporting and strengthening a clear mind and a calm center amidst the storms of daily life. Mahalo + find your slippahs! ​“At the end of the day, it's not about what you have or even what you've accomplished. It's about what you've done with those accomplishments. Its about who you've lifted up, who you've made better. It about what you've given back"
It's time to go home with a softened face, heart and mind. It's time to integrate and share a self-nurtured and self-activated you with the world. Keiki Yoga Kohala is a sponsored project of the North Kohala Community Resource Center in Hawi, Hawaii.